I have been a long-time fan and reader of Indian Beauty Zone, and I feel really excited now that I am writing for it. And, my special thanks to Radha for giving me this opportunity. Today, I am going to review two of my favorite shades lipstick from Oriflame, i.e. 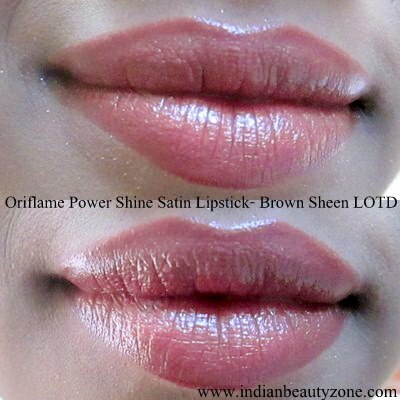 Oriflame Power Shine Satin Lipstick- Satin Mauve & Brown Sheen. Well, these were my first mauve and brown lipstick, honestly, I never wanted to wear brown lipstick and also mauve. But, these two I got as gift, so I was very curious to try these shades for the first time. Price & Quantity: Each INR 398 for 1.6g. Shades Reviewed: Satin Mauve (24946) & Brown Sheen (24947). RICINUS COMMUNUS SEED OIL, CALCIUM ALUMINUM BOROSILICATE, OCTYLDODECANOL, SYNTHETIC FLUROPHLOGOPITE, POLYBUTENE, MICA, SILICA, PENTAERRYTHRITYL TETRAISOSTEARATE, CAPRYLIC/ CAPRIC TRIGLYCERIDE, BIS-DIGLYCERYL POLYACYLLADIPATE-1, -DIGLYCERYL POLYACYLLADIPATE-2, LANOLIN, CANDELILLA CERA, PARAFFIN, POLYETHELENE, CERA MICROCRISTALLINA, ETHYLHEXYL METHOXYCINNAMATE, CERA CARNAUBA, TOCOPHERYL ACETATE, BUTYL METHOXYDIBENZOYLMETHANE, PARFUM, TIN OXIDE, CANOLA OIL, PROPYLPARABEN, ROSA CANINA FRUIT OIL, TALC, BHT, TOCOPHEROL +/-: CI 15850 CI 42090, CI 19140, CI 45410, CI 73360, CI77491, CI 77492, CI 77820, CI 77891. 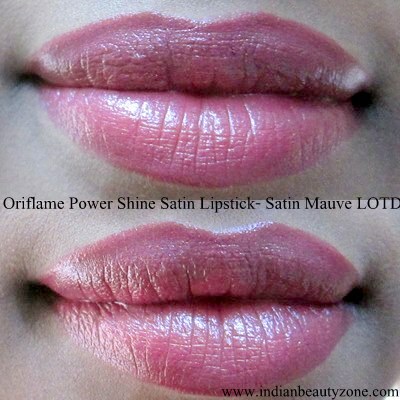 Oriflame Power Shine Satin Lipsticks come in a very sleek and slim packaging. The silver color packaging looks very classy and chic. Also the thin belt of the lipstick shade in the middle of the lipstick is quite helpful recognizing the shade. These lipsticks are with shimmers. Both the shades are highly pigmented; so, even one swipe gives the perfect color. The shimmers are not over powering, but they are bit difficult to remove from the lips. The smell is strangely lovely, it smell like fresh cucumber. Because of this smell, I like these lipsticks a lot. Satin Mauve shade is quite like magenta mixed with mauve. I love magenta shade, but this is my first mauve. This color looks perfectly wearable in day time and it looks very attractive in night light. color mixed with little hint of pink. I have medium skin tone, and these shades look quite suitable for me. Since the lipsticks are very much pigmented, 1.6g will go a long way. The bullets are creamy but not easily breakable. It glides on the lips very smoothly and covers pretty well. These are perfectly travel-friendly. The staying power of these lipsticks are more than average, it stays for 6-7 long hours. It never settles in fine lines and does not fade easily. Though, it does not survive my eating sessions. But, once I go out wearing these, I might not have worry about reapplying for a really long time. Small amount will go long way. Name- Arshita Dhara, Skin color- medium/ whitish, hair color- brownish black, hair type- medium length wavy, skin type- normal skin with T-zone oily. Hi, I am Arshita and I am pursuing my higher studies, also trying my hands in writing about fashion and makeup. I am a happy-go-lucky girl but also very sensitive and with a very friendly nature. I am very excited to meet you all. Hope you guys enjoyed my review article. Brown sheen is such a gorgeous shade. Nice review Arshi! Lovely shades but not for my skin tone. LOL, really? Thanks dear! :) Yea, the shimmers are quite irritating. Nice..satin mauve is much better! Shimmers I dont like..dnt even suit my skin tone. Oriflame is my fvrt brand, I am using it's various products. How did you celebrate the festival Radha? You reviews are always the best, and I must say that these colors are great on you, really like how they look! Both shades are very beautiful... great review honey!!!! Arshita, your lips resemble Priyaka Chopra's lips! So Hot! Any lipstick will look good on that pout! Hi Arshita! The shades look gorgeous for a day look, thank you for the review, xoxo. 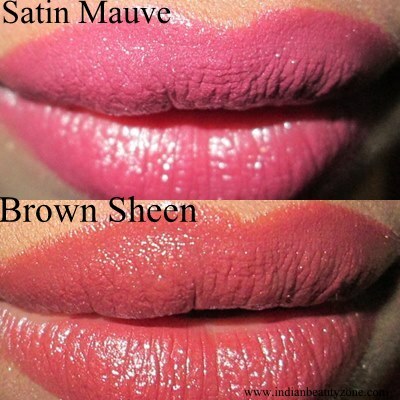 mauve is what i want... pretty bee stung lips! I'm not a fan of brown shades but these shades looks beautiful on you <3 .. Lovely lip swatches :) Killer !